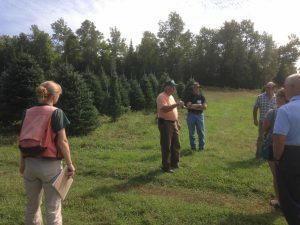 Maine Christmas Tree Association holds membership meetings twice per year. The winter meeting is generally held in Augusta in January, and the fall meeting is held in September. They are usually hosted by a MCTA member at their farm and will include field tours. You do not have to be a member to attend meetings although you must pay a registration fee. It is suggested that you register in advance and reserve meal tickets as well as partake in all the activities, networking and socializing that take place at the meeting. For information on the next meeting contact the Executive Secretary, Joanne Bond at (207) 793-4658.